Fred lugs home a 100-pound burlap bag of freshly dug potatoes. For lack of room in his small house he leaves the sack outside in the sun for a few days. When he later picks up the bag to bring his potatoes in the house seems much lighter. Fred thinks someone has stolen some of the potatoes and contacts his friend, a local police officer. Careful examination of the bag shows that the seal has not been broken. It is full of the potatoes that Fred originally bought. But the bag, which weighed 100 pounds when he made the purchase, now weighs only 50 pounds. How can this be? Another friend, a mathematician, laughs at Fred’s dilemma. He explains that he is a victim of the “potato paradox.” The potatoes in the bag simply dried out a little in the sun. They contained 99 percent water when they first were dug from the ground. While in the sun the water content dropped to 98 percent. So how can this account for a 50 percent weight loss? 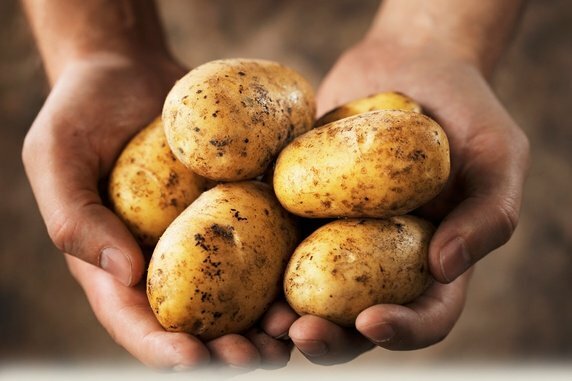 It means that potatoes were about 99 percent water when they were freshly dug. Thus the solid weight of the potatoes in the bag was only one pound if you eliminate all of the water. This means the potatoes Fred purchased contained a 1:99 ratio. If the only one percent of the water in each potato evaporated, the ratio dropped to 1:98, or 98 percent. Since the solids still weigh one pound, then the lost water weighed 49 pounds. The potato paradox is known as a vertical paradox in which the result appears absurd, but with mathematics, it can be shown to be true.